Another of my must-haves for my art A to Z is William Blake. He was included last year in my poetry A to Z (being the ultimate Renaissance Man), our abiding fondness originating from his influence on Philip Pullman's Dark Materials Trilogy. Blake has many links to classic literature, having worked on illustrations for the Canterbury Tales and Dante's Divine Comedy (a project interrupted by his death in 1827). 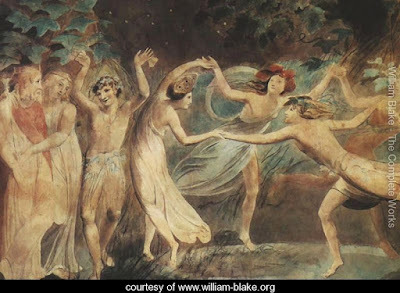 This painting however references Shakespeare and shows 'Oberon, Titania and Puck with Fairies Dancing', from A Midsummer Night's Dream.